Believe us, we are very sorry to inform the JIO community about this shocking news. Yes, the title isn’t spreading any HOAX about the expiry of the most loved JIO’s Happy New Year Offer. As you people already know, the JIO rivals are so much frustrated with these JIO’s free offers. Airtel and IDEA are singing the same songs from decades, now the Vodafone has also joined their group. This time Vodafone has moved to the Delhi High Court, claiming that TRAI (Telecom Regulatory Authority of India) has failed to restrict “evident violation” of their tariff directives, guidelines and regulations, by allowing RJIO (Reliance Jio Infocomm Ltd) to continue with these unacceptable free offers. 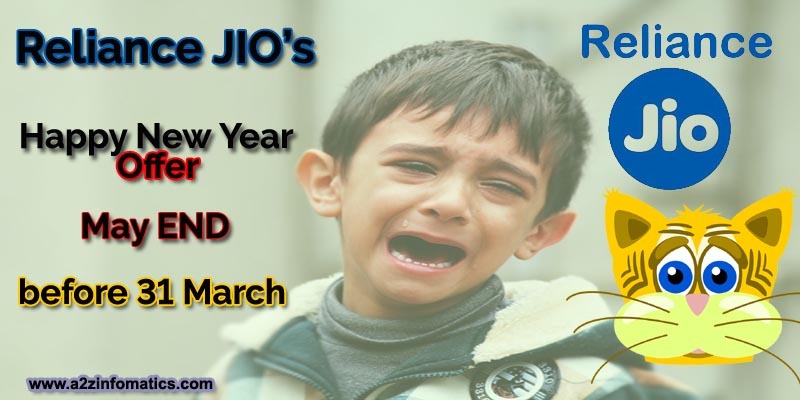 Reliance JIO Happy New Year Offer May or Will END on 1 February / Before 31 March Latest News. Earlier, when the complete issue came up to the Justice Sanjeev Sachdeva, who outlined the whole matter for court hearing on February 1 2017, without making RJIO as a party in the matter. The court decision will directly effect all Jio happy new year offer users, if anything goes against the RJIO. After the Oral plea from the Vodafone, finally RJIO was made a party in the matter. Vodafone has also alleged that the TRAI (Telecom Regulatory Authority of India) also failed to execute the DoT (Department of Telecommunications) circulars, which clearly puts each and every tariffs with the compliant of IUC (inter-connection usage charges). All the JIO rivals are mentioning the free “Happy New Year offer” as illegal, they added that the free offerings are violating the upper limit of 90 days, for any promotional offer. Just few hours left for the final verdict by the honourable High Court, keep your fingers crossed and wish to have any good news about your loved Reliance JIO’s “Happy New Year” offer. In case, the decision goes against the RJIO (Reliance Jio Infocomm Ltd), don’t get worried or feel any tension about losing JIO Happy New year offer before 31 March. JIO people still have many surprise GIFTS lefts in their bags, who knows if they announce the same “Happy New Year” offer benefits for just INR 100 for the complete year 2017 🙂 . It will be interesting to follow JIO’s rivals activity, if JIO change their track by providing all “Happy New Year” offerings at any nominal recharge under Rs 100. How to BUY Reliance Jio Rs 1000 4G Mobile / Smartphone with VoLTE Support. Free Mobile Recharge Offer of Rs. 100 by Miss Call to 18005320295 News. Like every happy JIO user, we are feeling nervous too and waiting for any good news for all of us. If anybody wants to add their suggestions to this, please write them under the comments section below. We would love to add the positive one’s to this stuff. Thanks for the reading and support, enjoy JIO Happy New Year Offer.